Plasma spray coating is the most flexible process out of all the thermal spray processes. Basically, it is the spraying of molten or heat-softened material onto a surface to provide a coating. The utilization of the powerful plasma spray coating technology can facilitate the spraying of almost any ceramic, cermet or metal onto a wide variety of materials with exceptional bond strength as well as a minimal distortion of the substrate. The objective of plasma spray coating is to heat up and scatter material particles across the work surface with minimum waste and overspray. Before the HVOF system was invented, plasma guns were widely used for adding velocity to the material particles. Plasma arc, as the gun is named, was devised as an electrical appliance that could effectively replace the old flame spray machines. These guns can heat up the particulates to a certain degree so that they can easily be deformed to be applied on the work surface. 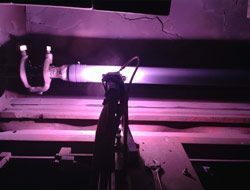 By connecting the poles of a power supply unit to an electrode and concentric nozzle, a plasma arc can be created. A high flow-rate inert gas (either the combination of nitrogen & hydrogen, or the combination of argon & hydrogen or helium) along the arc’s axis can be added to push the arc forward to the front of the plasma gun. Next, we inject the powder (made from metals, ceramics or cermets) into the flaming plasma near the nozzle. The gas and powder arc expands rapidly and the resultant velocity pushes the hot powder particles forward. Under high velocity, these molten materials are propelled onto a substrate, causing a high integrity coating with excellent bonding. Due to our vast experience in the field of metal and ceramic coatings as well as the capabilities of our laboratory facilities, engineering department, and machining facilities, A&A Coatings is highly capable of assisting you in any phase of thermal spray coatings. Call us today to request information on specific plasma spray materials that you are interested in.